It would be an extended porphyrin (a pentadecaphyrin to be precise). Nature likes to make molecules out of tetraphyrins (chlorophyll, haemoglobin, etc), and so we are pushing beyond nature’s own boundaries. Both a penta and a hexadecaphyrin have already been made (DOI 10.1002/chem.200701909, 10.1021/ja005588o). The trefoil knot is a most interesting object in a branch of mathematics called knot theory, and it is also related to another fascinating object, the Möbius band. The pyrrole units in such a molecule are conjugated via the π-system, and the molecule above is potentially fully conjugated across its entire length. This could make it aromatic, and hence it is interesting for the same reason that Willstätter found cyclo-octatetraene so. The system above, if carefully counted, would have 74 π-electrons in cyclic conjugation. This would make it a 4n+2 aromatic (n=18), just like benzene, but not at all like (CH)8 (which as Willstätter and Waser found, is not aromatic). It seems highly twisted. Indeed the title of this post is super-twisted. But is it really? We learn from topology that twist is not the only property that cyclic bands or strips can have. They can also exhibit writhe. So is it writhed as well as twisted? Aromatic molecules have one rather mysterious behaviour. The ring bonds in in such systems resemble neither double nor single bonds, but aromatic bonds, and in this they have a length intermediate between the single and the double, and this applies to all of the bonds. The origins of this delocalization continue to provoke controversy (see this post). Thus it is thought that only (planar) carbon rings with around 26 or less π-electrons can exhibit such equal lengths (boron rings can apparently go much further, see 10.1039/B911817A). More than that, and distortion sets in which makes the lengths alternate. The molecule above has 74 π-electrons. What will its bonds do, and is what they do related to the twist (or the writhe) of the system? The trefoil is chiral. It cannot be superimposed upon its mirror image. But how chiral (whatever that means)? The system has many design handles, including the number of pyrrole (or thiophene) units, the number of N-H vs =N motifs, and the scope for templating using a metal cation (Mg in the example above). So what might be the properties of our trefoil knot? I am going to list only two here. A theorem emerged from mathematics in the 1970s known as the White, Cãlugãreanu, Fuller Theorem. It defines the topological properties of bands in terms of a quantity known as the linking number (Lk). The theorem states that: Lk = Tw + Wr, where Lk is an integer, being the sum of two properties Tw (the total twist of the band) and Wr (the total writhe of the band). This theory was recently extended to the analysis of twisted conjugated molecular rings (DOI: 10.1021/ja710438j), for which Lk adopts integer values (in units of π). Thus a conjugated Möbius π-cycle has a value Lk = 1π (specifically when describing the band formed by the π-electrons). Most of this value is composed of twist rather than writhe. What of our molecule? Well, it has Lk =6π, and this comprises Tw = ~ -0.8π and Wr ~ +6.8π (yes the two can be either positive or negative, and do not have to be the same sign). The surprise is that it is (overall) hardly twisted! The knot is composed almost entirely of writhe. So much for the title of this post! What about the bond lengths? The best way of analyzing these (see DOI: 10.1021/ol703129z) is to compare pairs of so-called meso-bonds, being the coupler unit connecting any two pyrrole rings. Around the cycle, all the C-C meso-pairs are ~1.4Å and the C-N pairs are both ~1.34Å. That characteristic of benzene, in having all its (C-C) bonds equal, seems true here as well (at least at the B3LYP/6-311G(d,p) level, see e.g.10042/to-2109. There are reasons for thinking that in fact the B3LYP method does predict this behaviour more or less realistically). By the way, a molecule with a π-linking number of six is indeed classified by the same selection rule as benzene, ie 4n+2 (odd numbers of Lk are governed by a 4n rule instead). It is tempting to conclude that perhaps the extended conjugation of this molecule (shown by the bond length equality) is somehow connected to the dominance of writhe over twist in this trefoil. I will follow this post up with another relating to the predicted chiro-optical properties. For now, I leave its synthesis to be contemplated by a present day Willstätter or Waser. This entry was posted on Monday, May 31st, 2010 at 3:51 pm and is filed under Interesting chemistry. You can follow any responses to this entry through the RSS 2.0 feed. You can leave a response, or trackback from your own site. Fascinating discussion – it would be fun to render this molecule in Second Life – do you have the SMILES handy? Is it even possible to encode topology into a SMILES or InChI? The Jmol rendering show 2 S centers – are those correct and how did you determine? As usual, the calculation (in fact one of several) is archived in our digital repository as DOI: 10042/to-2109, which is linked to the post above, and this should also contain the InChI. You probably do not want the SMILES, which is only 2D, and probably cannot describe the topology of this system at all! I suspect the InChI cannot either! Comments please. The chirality is an error (left over from another molecule) and will be corrected shortly. It is helical chirality, but whether there is a CIP rule for it is an interesting question. Normally, the direction of the helix is indicated with M or P, but I would have to think about whether this can be applied for this molecule. Suggestions welcome! That is most interesting (but perhaps not entirely unexpected, given that SMILES and InChI are purely based on connection tables). Given the complexity of the CIP rules for stereochemistry, encoding these into eg InChi would be enough to make the heart of the bravest programer blanche. From my point of view, another type which causes concern are transition states. Modellers are now generating structures for these in droves, but eg the InChI for them depends very much on the program used to generate the visualisation (and whatever rules it has for connecting bonds). Since there is no uniform standard for such connectivity, I suspect e.g. the InChI generated by two modellers for the same system, but using different intermediate programs, will be quite different. I actually believe that transition state geometries will become much more prevalent and useful in the future, and we do not yet have a proper way of identifying them. I have occasionally speculated about QTAIM as an algorithm for this, but the method also has some unfortunate side effects. An afterthought, relating to the CIP (Cahn-Ingold-Prelog) classification of the chirality of the trefoil. I noted the linking number Lk in my post, this taking the value of 6. In fact, this quantity can have two value, +6 or -6, depending on the which enantiomer of the knot one analyzes. So in that sense, the Lk value is indeed also a CIP chirality index! 1) In the Jmol representation (and in your image) there is some atom at the center of the molecule. What is the atom, and is there a need for an atom to be at the center to get the molecule to have this particular shape? If we think of the molecule as a central atom and a ligand, what’s the charge on the ligand? t looks in first pass as if it needs to be +3. 2) Could one replace the three nitrogen atoms that coordinate to the central atom with carbons – make the interconnecting chains between the pyrrole groups pure hydrocarbons? This might push too many protons into that central region and destabilize the knot. 3) What is the point group of the molecule? 1) The ligand is 2-, and the atom at the centre is Mg2+; the system overall is hence neutral. There are 12 NH pyrrole units (5e each, including the meso carbon), and three imino-pyrrole units (4e each, including the meso-carbon), making 72 π-electrons around one path for the ring. The 2- charge elevates this to 74 electrons = 4n+2 (n=18). 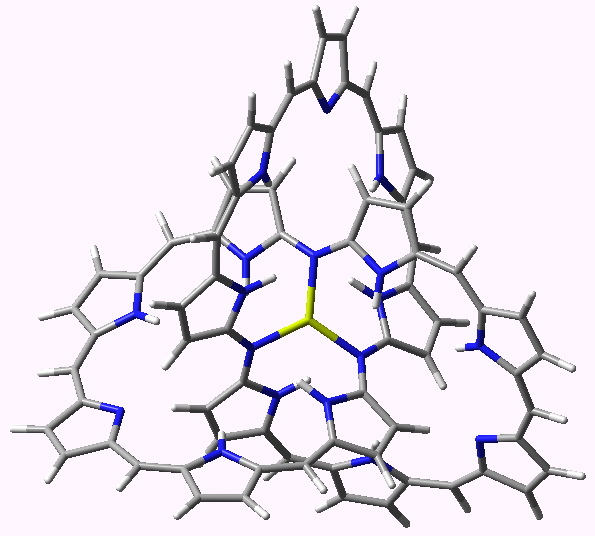 Think porphyrin itself, which has two NH pyrroles (2*5) and two imino-pyrroles (2*4) = 18 = 4n+2. Since the molecule is unmade, I have no idea if a central atom is needed to hold it together. But the idea was to use that atom as a template. The pentadecaphyrin is in fact a tri-azaphyrin, but whether the Mg would go for these meso-nitrogens, or the pyrrole nitrogens remains to be established. 2) Yes, the point about the central nitrogens was to remove what would otherwise be a steric clash in the middle! 3) The point group is D3, which is a chiral group. D3 is only possible if there is no bond length alternation; this is recovered with the B3LYP functional. The free ligand, reported in the follow up post, is D3 and all the calculated frequencies are positive. I tried the ωB97XD functional to allow dispersion forces to operate within the knot, but this slightly reduces the symmetry to C2. The jury is still out as to whether B3LYP gets the structure of such higher annulenes correct or not. Certainly a 5th rung double hybrid method (to be precise RI-B2GP-B2PLYP-TZVPP-TZVPP/C) which should get the long range correlations correct, predicts (as does B3LYP) a non-alternating geometry for  annulene itself. I would not wish to imply that the system shown is the only viable option. There are many variables which perhaps should be systematically explored. These would include the number of pyrrolic units (I chose 15 because its divisible by 3, and seemed the smallest unit which would not be too strained), the number of NH vs N=C motifs (again, 12H was chosen to be divisible by 3), thiophene could replace pyrrole (as it does in many higher phyrins), etc. To some extent, this unfinished aspect of this molecule seems to make it a better candidate for a blog post than a conventional article. In reality, it may also be of interest to indicate other reasons why I did post it. Well, I am giving a lecture this Friday, which is limited to 30 minutes, and it seemed worth while exploring the blog as a means for elaborating some of the slides with more detail and argument. About half the content is unpublished, and rather than just sit on these results, it seemed somehow appropriate to put them on the blog (you will note from the date of the digital repository entry that in fact the calculation is more than a year old) for others to perhaps get a spark of inspiration from.